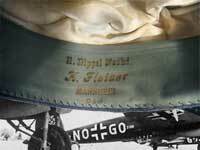 The yellow piping indicates he is in the flight troops or paratroops of the Luftwaffe, but his decorations and badges narrow it down. 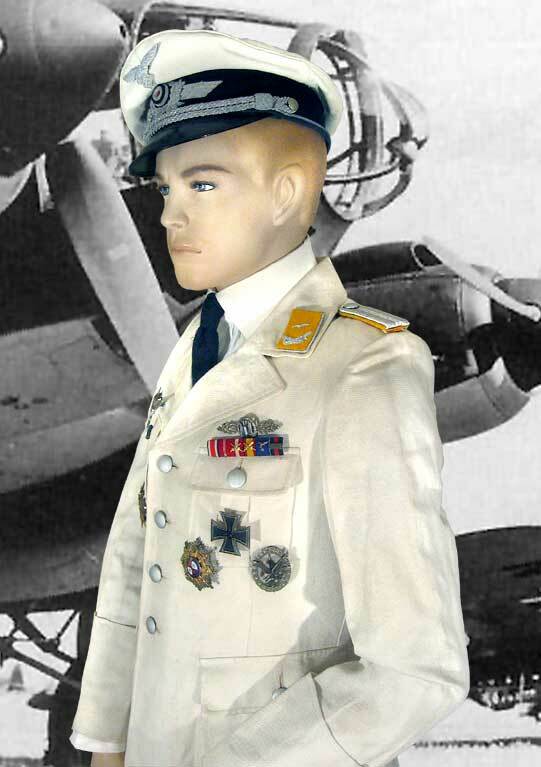 The aerial gunner/radio operator badge on his left breast and the silver bomber clasp above his left pocket indicate he is a kampfflieger or bomber crewman. 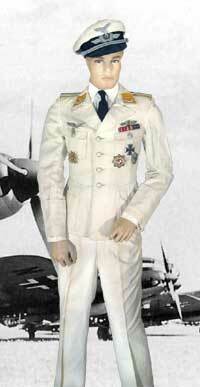 This Leutnant is standing in a summer field filled with early war aircraft. He wears the full dress summer uniform in white. It is made out of a cotton waffle-weave fabric and unlined. 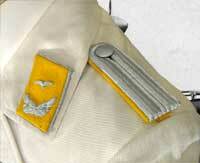 The uniform was finished off with white dress shoes, white shirt and tie. 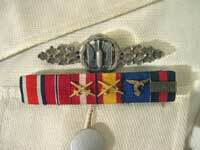 The dress belt and dagger could be added for parade occasions. 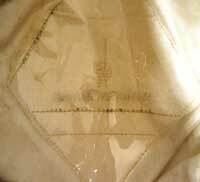 The hat has a removeable top, the tunic has removeable buttons and boards as well as collar tabs that are snapped on so that the tunic may be laundered. *Click on any picture to see full size. A close-up of the rank badges show the yellow color of the flight troops. 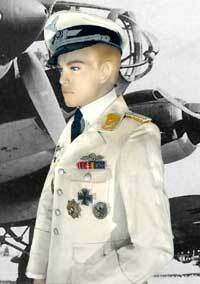 As an officer, he wears shoulder boards with solid silver braid. Pips would be added as he is promoted. 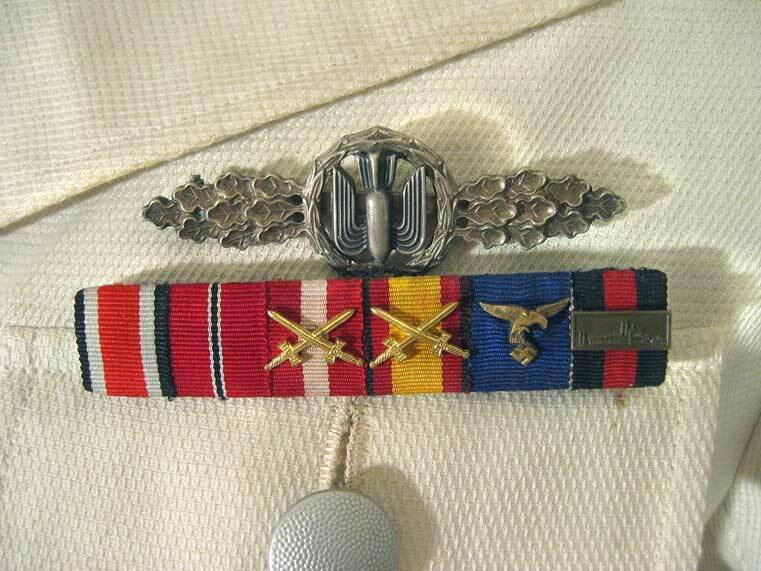 The collar tabs for officers show the eagles surrounded by a wreath. As a leutnant, he has a partial wreath and one gull. 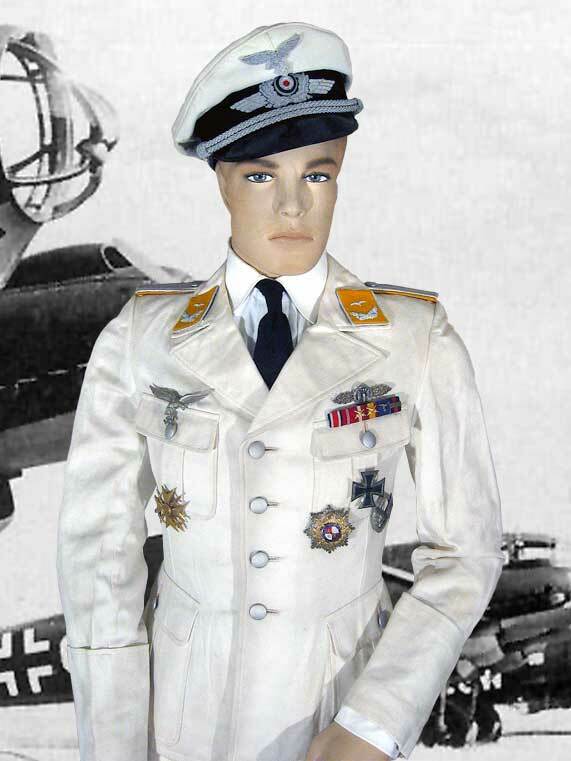 Above the right breast pocket is a pre-1937 style eagle, the emblem of the Luftwaffe at the time of hostilities in Spain yet worn throughout the Second World War on summer uniforms and flight jackets. 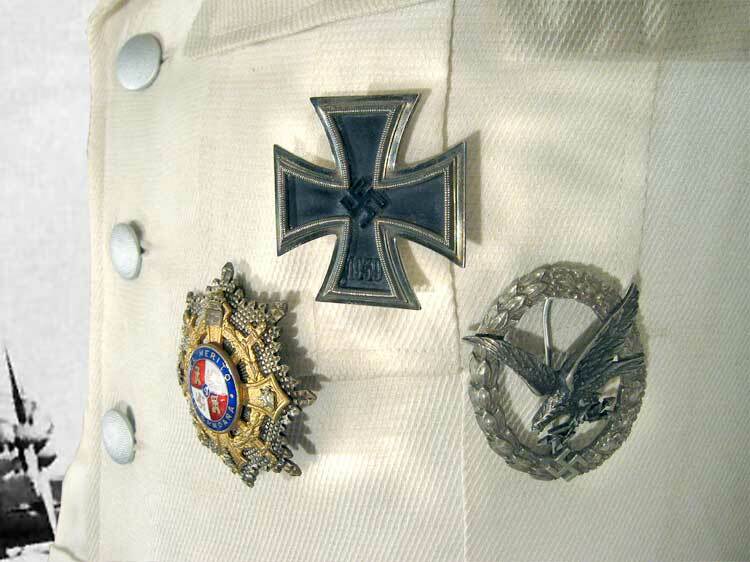 On his left breast pocket is the Iron Cross 1st Class (an award for bravery reestablished in 1939 after the outbreak of war on September 1st), the Spanish Breast Star to the War Cross which accompanied the awarding of the Spanish Cross in Gold, and the Fliegerschütz-enabzeichen für Bordfunker or aerial gunner/radio operator badge, initiated on March 26, 1936 and identifiable by the lightning bolts clutched in the eagle's talons (this same badge without lightning bolts is the aerial gunner/flight engineer badge). 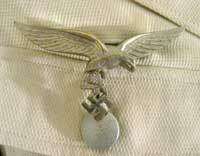 On his right breast pocket is the Spanienkreuz in Gold, or Spanish Cross in Gold, instituted on April 14, 1939 (awarded only 1,126 times) denoting extraordinary service as a volunteer in the Luftwaffe's "Legion Condor" in Spain during their Civil War from 1936 to 1939. The Spanish Cross also came in a bronze grade with or without swords (swords for combatants) as well as a silver grade that was awarded either with or without swords as well. 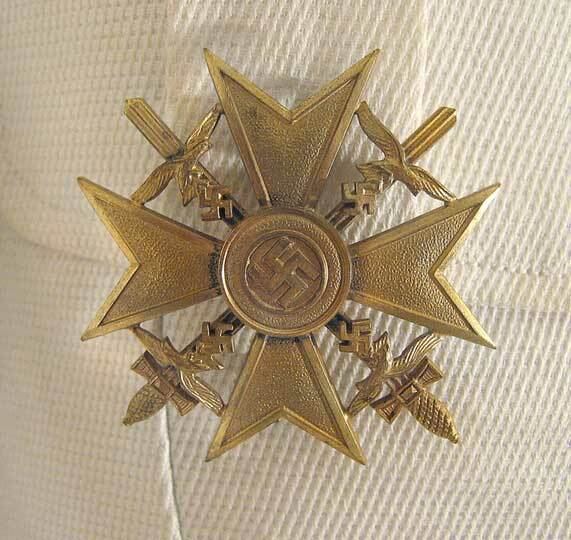 A close-up view of the Spanish Breast Star to the War Cross. 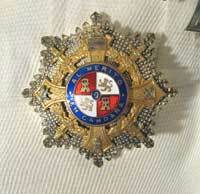 This is a an impressive badge made of silver, enamels and gilt, attached to the uniform with a large clasped pin. Above his left breast pocket is the Frontflugspange für Kampfflieger in Silber, or silver grade bomber clasp awarded to pilots and crew who successfully completed 60 operational flights. 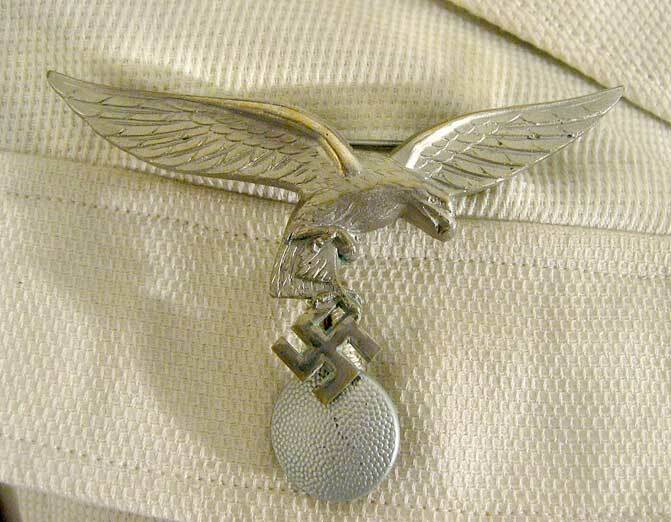 This clasp, initiated on January 30, 1941, depicts a winged bomb within a wreath with radiating oakleaves on either side. The ribbon bar is made up of the following awards, from left to right: Iron Cross 2nd Class, the Ostmedaille or Eastern Front medal, the Spanish Military Service Cross with Swords device (denoting combat), Spanish Campaign Medal with swords device, Luftwaffe 4th Class Long Service Award, and Commemorative Medal of October 1, 1938 which celebrated the annexation of Czechoslovakia. 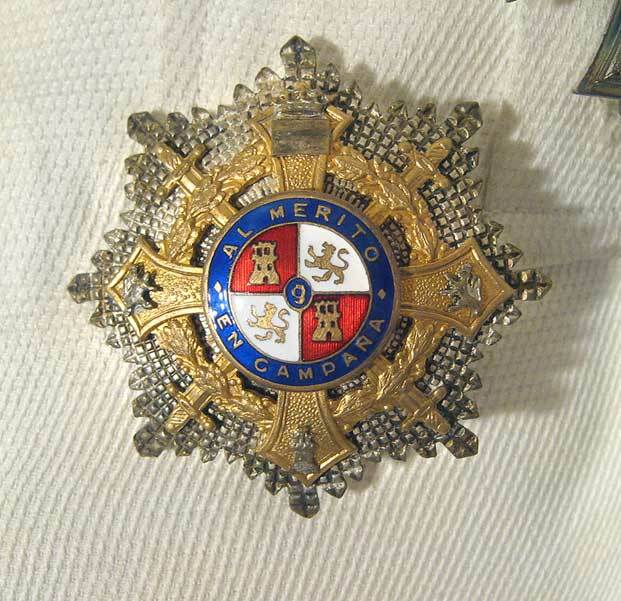 The device on this ribbon is called the "Prager Burg" clasp, depicting Prague Castle and awarded to those who also participated in the takeover of Bohemia and Moravia in addition to Czechoslovakia. The inside sweatband shows the name of the tailors shop in Mannheim. 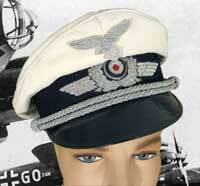 A close-up view of the cap shows the level of detail and finish in this superior quality officers visor hat. The eagle, wreath and chinstrap are all made of heavy bullion (as opposed to less expensive aluminum stamps). 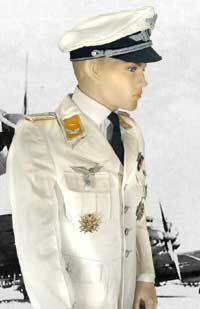 The top was removable and could be exchanged for the blue-grey winter top. The sweatshield in the crown of the cap shows the name of the hats manufacturer with a slot for the owner's name.